Out of the above types only JK and D flip-flops are available in the integrated IC form and also used widely in most of the applications. Here in this article we will discuss about JK Flip Flop. 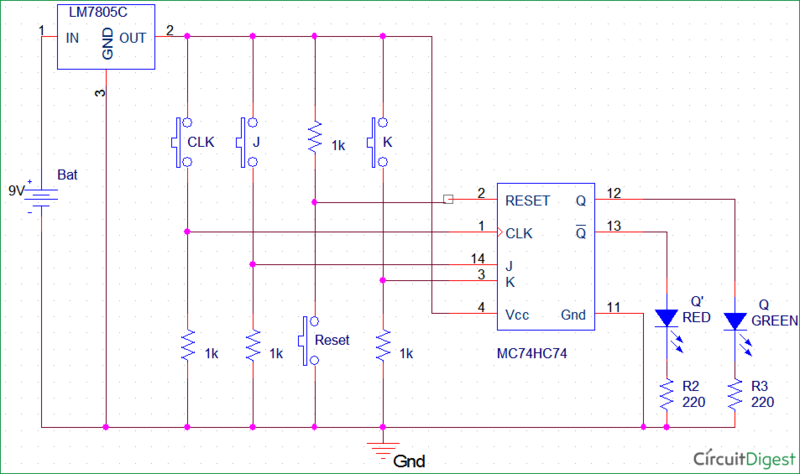 Whenever the clock signal is LOW, the input is never going to affect the output state. The clock has to be high for the inputs to get active. Thus, JK flip-flop is a controlled Bi-stable latch where the clock signal is the control signal. Thus, the output has two stable states based on the inputs which have been discussed below. The J (Jack) and K (Kilby) are the input states for the JK flip-flop. The Q and Q’ represents the output states of the flip-flop. According to the table, based on the inputs, the output changes its state. But, the important thing to consider is all these can occur only in the presence of the clock signal. This, works like SR flip-flop for the complimentary inputs and the advantage is that this has toggling function. Output: Q = 1, Q’ = 0. Working is correct. The RESET pin has to be active HIGH. All the pins will become inactive upon LOW at RESET pin. Hence, this pin always pulled up and can be pulled down only when needed. The IC used is MC74HC73A (Dual JK-type flip-flop with RESET). It is a 14 pin package which contains 2 individual JK flip-flop inside. Above is the pin diagram and the corresponding description of the pins. IC MC74HC73A (Dual JK flip-flop) – 1No. The IC power source VDD ranges from 0 to +7V and the data is available in the datasheet. Below snapshot shows it. Also we have used LED at output, the source has been limited to 5V to control the supply voltage and DC output voltage. 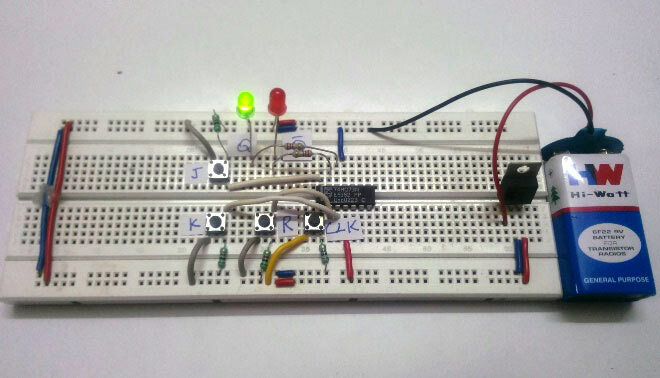 The buttons J(Data1), K(Data2), R(Reset), CLK(Clock) are the inputs for the JK flip-flop. The two LEDs Q and Q’ represents the output states of the flip-flop. The 9V battery acts as the input to the voltage regulator LM7805. Hence, the regulated 5V output is used as the Vcc and pin supply to the IC. Thus, for different input at D the corresponding output can be seen through LED Q and Q’. The pins J, K, CLK are normally pulled down and pin R is pulled up. Hence, default input state will be LOW across all the pins except R which is state of normal operation. Thus, the initial state according to the truth table is as shown above. Q=1, Q’=0. The LEDs used are current limited using 220Ohm resistor. Note: Since the CLOCK is HIGH to LOW edge triggered, both input button should be pressed and hold till releasing the CLOCK button. For the State 1 inputs the RED led glows indicating the Q’ to be HIGH and GREEN led shows Q to be LOW. The working can be verified with the truth table. Note: R is already Pulled up so no need to press the button to make it 1. For the State 2 inputs the GREEN led glows indicating the Q to be HIGH and RED led shows Q’ to be LOW. The same can be verified with the truth table. For the State 3 inputs the RED and GREEN leds glows alternatively for each clock pulse (HIGH to LOW edge) indicating the toggling action. The output toggle from the previous state to another state and this process continues for each clock pulse. Note: R is already Pulled up so we need to press the button to make it 0. The State 4 output shows that the input changes does not affect under this state. The output RED led glows indicating the Q’ to be HIGH and GREEN led shows Q to be LOW. This state is stable and stays there until the next clock and input is applied with RESET as HIGH pulse. State 5: The remaining states are No change states during which the output will similar to previous output state. The changes do not affect the output states, you can verify with the Truth Table above. The complete working and all the states are also demonstrated in the Video below. clock must be edge trigger.relation between jk flip flop and d type & t type flip flops. is the truth table correct.output must associates to previous output. if my problems are incorrect,please tell me. Here the clock is falling edge triggered (HIGH to LOW edge). The truth tables are correct from practical point of view. it could be seen in above demonstration.